If you keep track of business ups and downs, you must familiar with the Nokia story, the one that did not end in a fairy tale ending. If not, here it is in a nutshell. Nokia, the ex-mobile giant that once commanded a staggering 70% market share fell from its pedestal to abysmal single digits in a matter of years. How? By failing to stay tuned to changing trends (rise of smart phones). You don’t want your precious business to go that route, do you? You can secure your business future by going digital. Today, digital is the buzzword alongside startups and innovation, with good reason. 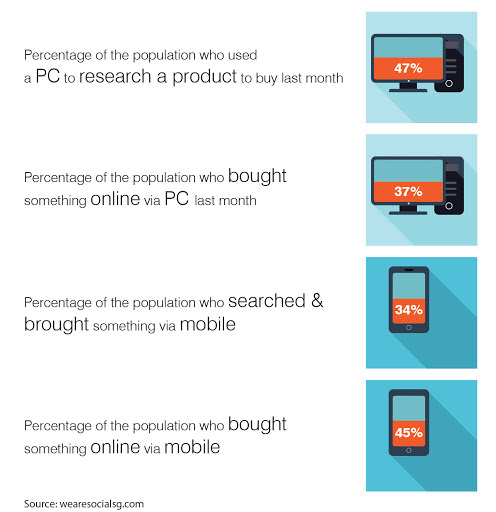 Web-friendly consumer population is on the rise significantly impacting global business, as you can see below. 70% customers are expected to migrate to digital players in the BFSI segment – The Finance World. 72% of B2B & B2C buyers say they expect half of their purchases to be made online by 2020. - The Future of Commerce. We will guide you for making your business ready for a digital future. You should not limit your business presence just to offline or a simple website. Create an ecosystem that encompasses web, social, mobile, email, SMS, offline etc. Some platforms are free and most of them are available for a nominal cost. This step allows you to create customer profiles and track their shopping behavior. Why is this important? Tracking helps you to know your customers better than themselves, offering them products that they really need, almost guaranteeing instant sales. It also helps you to create a standardized customer experience across all your touch points. While creating your ecosystem, ensure that your provide product data, walk-throughs and purchase options on all platforms, inclusive of website, mobile app, social media (buyable pins) etc. It can help you transform your workforce and empower customers. But for this to happen, your sales force should be in love with mobile CRM. In order for you to go digital, it might be necessary for you to rework your existing processes so that they can be redeployed on a digital platform. You can work upon your deficient areas and optimize them to be digital. As part of your initiative, implement a robust and agile self service platform. Integrate customer analytics that give you insights on digital traffic, user interactions etc. This will enable you to observe how far your initiatives are a success. Recreating core functionalities to be in line with your digital initiatives will not be possible with the active support and involvement by all your business stakeholders. And this means everyone from your field executives to C-level executives. By rewiring your processes to go digital, you can reduce overheads and maintenance costs. The savings can then be passed on to the customers or re-invested in improving your services. 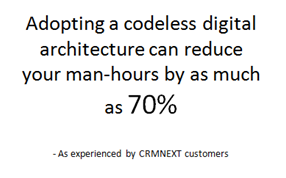 Rather than spending huge man-hours and costs to recode everything, opt for a platform that has code-less architecture. Adopt a viable and transparent process flows between functions and departments that will give you maximum visibility and accountability. Updating your IT infrastructure does not mean purchasing the latest hotshot tech gadget. It means that you keep your infrastructure up to date with the latest standards that are ‘proven’ to deliver benefits in terms of efficiency, service or productivity. For this to happen, you have to have total ownership and control over your IT basics. Integration with the latest analytical engines will improve and speed up decision making. Plan according to your budget. If needed, you can go step by step, like improving your existing processes with cloud deployment. As another instance, you can implement a scalable CRM platform on the cloud, which can be public or private, depending on your business needs. Scalability is an important point as you don’t want to spend huge bucks for upgrades as your business grows. Make sure that whatever IT investments you make are optimized to give you the maximum investments. Awareness is power. For your business to thrive amidst intense competition, you need to track peer movements (friendly or otherwise). You can boost your brand's social presence by implementing social CRM. This will allow you to increase customer engagement socially, observe brand mentions, convert feeds to cases/issues and speed up redressal process. You can also establish a competition tracker that monitors latest technological developments and maps out the competition. Check out new entrants and analyze their digital offerings. They can be a important source of inspiration to bring out new digital initiatives to arrest your customer churn. First mover advantage counts a lot in future digital world. Avoid Nokia’s fate by preparing your business for a digital future. Digital in a true sense means provides seamless and fast service to your customers. Implementing Digital CRM can go a long way in providing customer delights and turning them into brand advocates.